What is a Static Compactor? Static compactors, as with portable compactors, are used for compacting mixed waste, meaning they improve your business efficiency as there’s no need to separate your waste. A static compactor is different from a portable compactor because it is bolted to a concrete base. It compacts waste and disposes it into an attached compaction container. When full, the container is exchanged for an empty one by a haulage contractor. 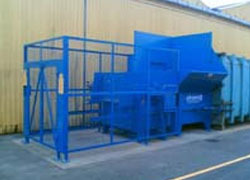 Typically, static compactors are used by companies with large volumes of dry waste. Static Compactors: What Are The Benefits? 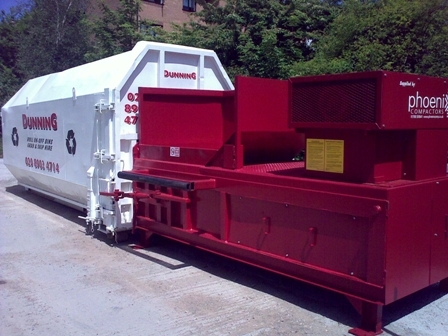 Our static compactors are built to suit your needs and can be designed to bespoke requirements. They are available with multiple loading methods and adaptable output volumes, meaning we can tailor your static compactor to work in conjunction with the container of your choice. This helps to streamline your waste management, improve business efficiency and save on labour costs. We will ensure your compactor compacts waste to suit the containers you use to store and transport your waste. See our range of static compactors below with various loading systems. Standard hand-loading via hopper with counterbalanced interlocked lid. Dual loading facility with hydraulic loader for emptying wheelie bins from rear and open hopper for loading from side with tipping skips. 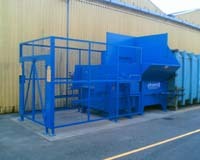 Compactor fed with printer’s trim waste by air-system from inside. 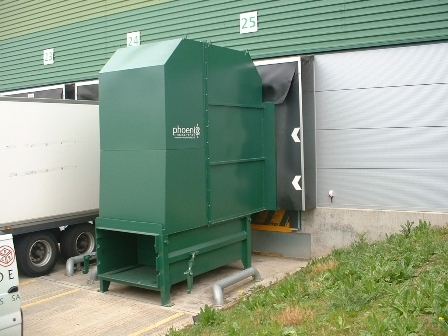 Bespoke ‘pod’ system built to allow secure, covered loading of compactor from client’s dock. Static with 35 cubic yard compaction container. Watch our company video HERE or call us on 01708 550641.